European beach handball sees a new edition to its event calendar emerging, with the first edition of the Champions Cup taking place in Gran Canaria from 31 October to 2 November. 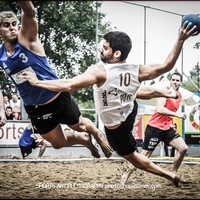 After it had been confirmed by the EHF Executive Committee in December 2013 that the event will see eight women’s and eight men’s national beach handball champions competing, the European Handball Federation, after registration had started on 1 September, faced such great interest that it decided to add another two teams per event as well as another playing day. “This is great news,” said Ole Jorstad, chairman of the EHF Beach Handball Commission, in a first reaction. Places at the Champions Cup 2014 were awarded on a ‘first come, first serve’ basis, and the first teams to sign up were the Swiss men from Copaca Bale and the ‘Beachqueens’ also from Switzerland who registered their interest straight on midnight on 1 September. It then took very little time for the remaining places to fill up. This means that both winners from this year’s European Beach Tour Finals, the men’s team from BHC Detono Zagreb and women’s competitor OVB, will also compete in the first Champions Cup. Substitute teams are SUS Nyborg from Denmark and BHT Auto Forum Plock from Poland in the men’s event and Skrim Kongsberg from Norway in the women’s event.